Property 2: Cozy Seattle Apt. w/Patio - 11 Mins From Downtown! EUREKA! Your perfect PRIVATE home away! Property 7: EUREKA! Your perfect PRIVATE home away! Go Tubing This Summer at the Waterfront Cabin! Property 12: Go Tubing This Summer at the Waterfront Cabin! Beautiful 1908 Grand Craftsman 5000+ sq. ft. living space. Property 14: Beautiful 1908 Grand Craftsman 5000+ sq. ft. living space. NEW! 1920s Bungalow - 2.5 Mi. to Downtown Seattle! Property 15: NEW! 1920s Bungalow - 2.5 Mi. to Downtown Seattle! Bright 1 bedroom backyard guesthouse in the vibrant Columbia City neighborhood. Property 21: Bright 1 bedroom backyard guesthouse in the vibrant Columbia City neighborhood. AMAZING DOWNTOWN SEATTLE LAKEFRONT RETREAT WITH 25 FT DOCK and HOT TUB! Property 39: AMAZING DOWNTOWN SEATTLE LAKEFRONT RETREAT WITH 25 FT DOCK and HOT TUB! NEW! 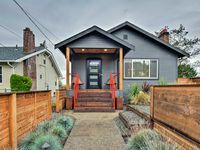 Lake Washington Home Steps from Leschi Shops! Property 43: NEW! Lake Washington Home Steps from Leschi Shops! Modern & Artsy Hip Oasis!! Walk To Light Rail, Restaurants And Shops! Property 46: Modern & Artsy Hip Oasis!! Walk To Light Rail, Restaurants And Shops! Quiet In-City Oasis, Walk to Light Rail + Great For Family! Property 47: Quiet In-City Oasis, Walk to Light Rail + Great For Family! We loved this house! Comfortable for our family of two adults and two teens, sparkling clean, new abc modern with a cool contemporary aesthetic. The front and back yard areas are lovely and a great bonus, are are the very clean basement&rsquo;s extra toilet and laundry machines (awesome to be able to do laundry). The neighborhood is cute and we enjoyed the proximity to Coleman Park and the beach/lake. Easy parking, easy to get everywhere in Seattle. Comfortable beds in the house and quiet outside. A true gem! Highly recommend! Great place with a great location. Only 10 minutes to down town Seattle. Right off of a busy road very noisy in bedrooms. Had a hard time sleeping.